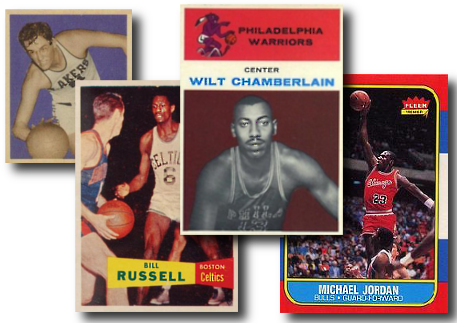 Do you collect vintage basketball card sets? We carry all brands: Bowman, Topps, Fleer and Upper Deck -- from the 1948 Bowman set to present day. Browse our extensive basketball set inventory and check out our basketball singles, and know that your online order is guaranteed through our fast, fun, and user friendly website. If you are unhappy with a set for any reason, return it for a 100% money back guarantee. How do we know you'll love our basketball card sets? Dean's Cards offers the very best basketball card buying experience. Whether it be the most rare basketball cards or the most expensive basketball rookie card; our cards our graded more consistently than anyone else. Hands down. Who else shows you every image of each card included in a set? Don't see what you're looking for? Contact us. We'll accommodate your needs and we're always building custom sets for our clients. At the end of the day, if you allow us to earn your business, you'll be glad you did! Showing 1 to 35 of 35 products.